I had time to slip into the SUArt Galleries Tuesday during my lunch hour to catch a couple of exhibits before they close on Friday. The first is North and South: Berenice Abbott’s U.S. Route 1. Anyway … back to Berenice Abbott. Berenice Abbott in 1979. Photo by Hank O’Neal. In the summer of 1954 the photographer and two companions traveled the length of U.S. Route 1, from Key West, Florida, to Fort Kent, Maine. During the trip Abbott made more than 400 8-by-10-inch photographs and more than 2,000 smaller images using her Rollieflex camera. The exhibit presents 50 images from Abbott’s journey, and in these pictures of Maine potato farmers, Florida motels, small towns and average Americans, we are given a snapshot of the nation during the post-World War II era. Potato farmer, Aroostock County, Maine, 1954. Two photographs stood out for me. The first was Daytona Beach, Daytona, Florida, 1954. The image shows some teens sitting on a railing in the foreground while an illuminated, soft-focus Ferris wheel or other amusement park ride spins in the background. You can almost hear the kids screaming with glee and smell the popcorn and cotton candy wafting in the air. The second image was No cursing, No drunks allowed—a low angle shot of a cop seated at coffee shop counter with his back to the camera. A boy in profile leans against the counter on the other side, facing the police officer. A ketchup bottle and a napkin dispenser sit on top of the white counter, and the composition draws the viewer’s eye toward the boy. The picture possesses a strong narrative quality—in line with the work of painters Edward Hopper and Norman Rockwell—and I imagined a scene where the police officer was the boy’s father and he was giving his son a lecture about the value of hard work and the importance of taking responsibility at a young age. In my story the boy worked at the diner after school. The small size of the framed works and the intimate gallery space allowed me to get lost in the images and discover how people in the U.S. spent their leisure time in the 1950s. Having undergone multiple brain surgeries, I have always found MRIs and CT scans of my skull and brain alluring. And in getting my blood drawn by phlebotomists, I often make a mental connection between the crimson color of my blood collecting in a plastic tube with bright red oil paint smeared on a canvas. In roaming through the exhibit space, where I saw images of kidneys (which looked like balls of yarn), the netlike pattern of thinning bones in osteoporosis, a placenta, a smoker’s lung, a healthy human brain (which looked like a Pollock drip painting) and a scan of a patient with prostate cancer, I came away with a feeling of compassion for the patients—the owners of these organs and the people suffering from the diseases on display. Many of the works offered bright colors and abstract patterns. But for me I was left with a strong theme of universality—the sense that all of our bodies will break down and ultimately fail us. The circumstances may be different, but the results the same. And in looking at some of the pictures, my faith tugged at me and I could not help but think that a divine master, call it God if you want, created this magnificent machine we call the human body. Both of the exhibits wrap up on Friday, March 9. In September I traveled to New York on two occasions to gather video footage for Syracuse University’s Arents Award video tributes, which our department produces; the Arents Award is the university’s highest alumni honor. My colleague Bob and I stayed at SU’s Lubin House, the university’s home base for New York City operations. We also shot a few interviews there. While staying overnight at the Lubin House, I had a chance to walk into the Palitz Gallery on the premises and view the Robert Kipniss exhibition mounted there. The exhibit continues until Nov. 12, and my review follows below. The ventilation system hums inside the Palitz Gallery at Syracuse University’s Lubin House in New York City. 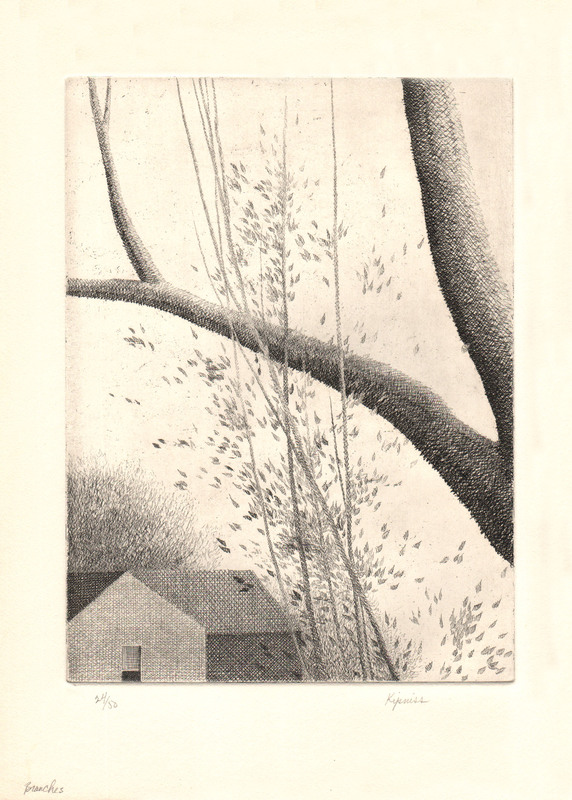 But standing in front of some of the graphic works of Robert Kipniss currently on view at the gallery, you may imagine other sounds—a screen door swinging shut, a train roaring in the distance, cicadas singing and the wind moving through tree limbs. 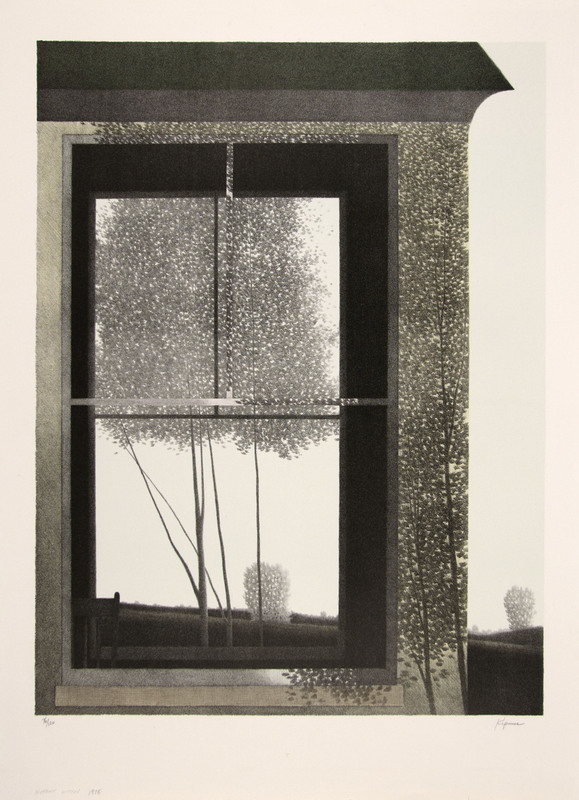 Quiet Intersections: The Graphic Work of Robert Kipniss presents more than 30 prints depicting interior still life scenes and rural landscapes composed of plants, windows, houses, trees, hills and fields. Most of the works are black and white, while others have subtle earth tones like mauve, green and brown. 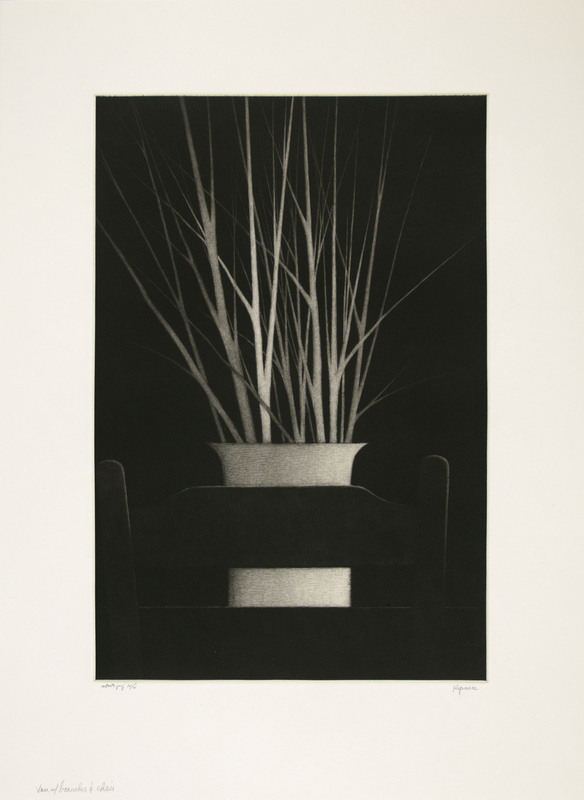 The prints are part of the Syracuse University Art Collection, a gift from James F. White, and cover more than 40 years of Kipniss’ career—from 1967 to 2013. Most are small works, the largest measuring 24 by 18 inches (height to width). These pieces show a consistency in style and composition, as the artist uses a dark palette, dynamic angles and carefully constructed geometric patterns to draw the viewer’s eye and create a moody atmosphere. With the human figure pulled from the scenes, we get the sense of seeing the subjective point of view of a person standing in a living room and looking out a window at a dew-covered backyard or hillside in southern Indiana, or sitting at the kitchen table in the early morning hours, sipping that first cup of coffee and observing the sunlight filtering through parted curtains. Hence, the works stimulate introspection and possess greater allure than straight still life or landscape prints. Their power lies in what they are able to represent or conjure in the mind of the viewer. And Kipniss prevails in his subtlety. This is not art on a grand scale showcased in a massive and overcrowded gallery space; instead, this is art to live with and reflect on, objects to hang on a wall and return to on a daily basis. Kipniss was born in Brooklyn in 1931. Both of his parents were artists and he developed an interest in both verbal and visual expression. He studied at the Art Students League and earned two degrees from the University of Iowa—a bachelor’s in English literature in 1952 and a master of fine arts in painting and art history in 1954. He won an art competition in New York in 1951 and was awarded his first one-man show. After serving in the Army, he and his wife returned to New York City. He worked evenings at the U.S. Post Office and spent his days painting and writing poetry. He then made the decision to devote his time entirely to painting, which meant he shelved his writing. He would, however, jot down observations about his life and work over the next several years, and these memories would form the basis of his 2011 memoir, Robert Kipniss: A Working Artist’s Life (University Press of New England). Kipniss has exhibited his work in more than 200 solo shows. He is represented in the permanent collections of several prominent museums, including the Metropolitan Museum of Art, the Whitney Museum of American Art, the Art Institute of Chicago, the Los Angeles County Museum of Art and the Museum of Fine Arts in Boston. He was elected to the National Academy of Design and to the Royal Society of Painter-Printmakers in London. The exhibition will remain on view through Nov. 12; it is open Monday to Friday from 10 a.m. to 6 p.m. and Saturday from 11 a.m. to 4 p.m. It is free and open to the public. The Lubin House is located at 11 East 61st Street between Madison and Fifth avenues. Contact 212-826-0320 or lubin@syr.edu for more information. After it closes in New York, the exhibit will travel north and then open in January at the Syracuse University Art Galleries in Syracuse, New York. This essay was published in the 2014 edition of Words & Images literary magazine, a student-run publication at the University of Southern Maine. I heard the woman first before I saw her or her partner inside the museum of the Onondaga Historical Association in Syracuse. She said in loud voice, “Rick, where are you hon?” The OHA had a few exhibitions running simultaneously on this Saturday in early January 2013, and so it was possible to lose sight of your friend or partner as you made your way through the different gallery spaces and inspected the various works. “Hon, come here, look at this,” she added. At the time I was examining the exhibit Manifest Destiny and The American West by Buffalo artist Robert Hirsch. Hirsch presented nearly one-thousand images in a three-dimensional display—with the pictures placed inside jars and serving as a commentary on how the geographic progression across North America shaped U.S. culture. After I finished looking at the Manifest Destiny jars, I started walking toward where the couple was standing. They were planted in front of some panels of an exhibit highlighting historic stereoscopic photographs. Rick was probably in his sixties. He was tall, broad-shouldered and bald except for a tuft of grayish-white hair at the back of his head. He had a bushy mustache that curled downward and matched his hair color and he was wearing a tan jacket. The woman, whom I will call Ruth, was small and also appeared to be in her sixties. She was wearing a black fur coat, tall black boots and bronze earrings that looked like costume jewelry. She had short black hair, a birthmark on the right side of her face and she had applied a little too much burgundy lipstick to her mouth. But it was her dialogue that made her memorable. I am not a casting director, but I believe you could pick Ruth up and place her in a Woody Allen film and without even reviewing the script, she would fit in with no problem. In fact I bet she would steal scenes away from Scarlett Johansson or Penélope Cruz. 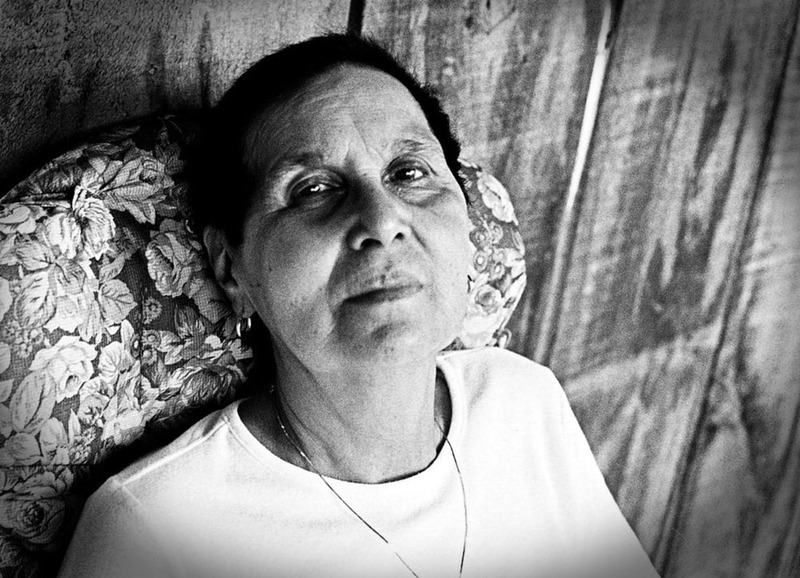 Something else about Ruth struck me on a personal level; she reminded me a lot of my late mother. My mother had never attended an art exhibit in her life and was not loquacious like this museum visitor, but the two women shared some physical features. Both were short and had short black hair. Ruth, Rick and I were gathered inside a small gallery space where Carl Lee’s multi-channel video Last House, which documents the destruction of a house in Buffalo, was being screened. In the piece, on what looks like a bright spring or summer day, a backhoe starts demolishing the house and three separate camera angles capture the action simultaneously. Viewers watch as the scoop of the backhoe starts eating away the roof and walls of the structure, while a man stands near the rubble and uses a power hose to spray water on the scoop and house so no sparks jump to life. As arresting as Lee’s video was, his exhibit became trumped by a living breathing work of art—the older couple that had seized my attention. And as I stood near the back wall of the room, my focus shifted from the images on the screen in front of me to Rick and Ruth seated on a black bench nearby. “You see that, it’s three angles of the same thing,” Rick said. I almost burst out laughing because her delivery was a spot-on impersonation of my mother, using the same words my mother had said to me on numerous occasions. But I managed to suppress the laughter swelling inside of me and kept it contained in my throat. “Well it’s 2:30,” Rick said. “Your watch is fast,” he said. And that’s how I left them. The couple was still sitting there, watching the video when I stepped out of the exhibition space and exited the OHA. I think what intrigued me most about the couple was their ease of interaction and level of comfort with one another. And I was thankful for having witnessed this slice of life from their apparent happy marriage, a snapshot of two older people behaving in an unguarded fashion in a public museum on an ordinary Saturday afternoon. I did not assume they lived a perfect life without worry or conflict. But it appeared Rick and Ruth understood and accepted one other unconditionally. In spending a few moments in their presence, it seemed like neither partner had any illusions about the other person, and there appeared to be no mysteries in their relationship still waiting to be uncovered. They had likely revealed all their flaws and weaknesses a long time ago, and yet, they still enjoyed spending time together and remained happily married and devoted to one another. Or at least that’s the impression they gave to outsiders. I often get a rush of creative energy after visiting an art museum, attending a play or concert or seeing a great film. And while I was walking home my rumination about the couple sparked an idea. I decided they would make a compelling subject for a modern art exhibit. A museum would build a large installation showcasing Rick and Ruth as one of the last surviving happy couples in America. It would be a spectacle like something 19th Century showman P.T. Barnum could have curated and promoted. 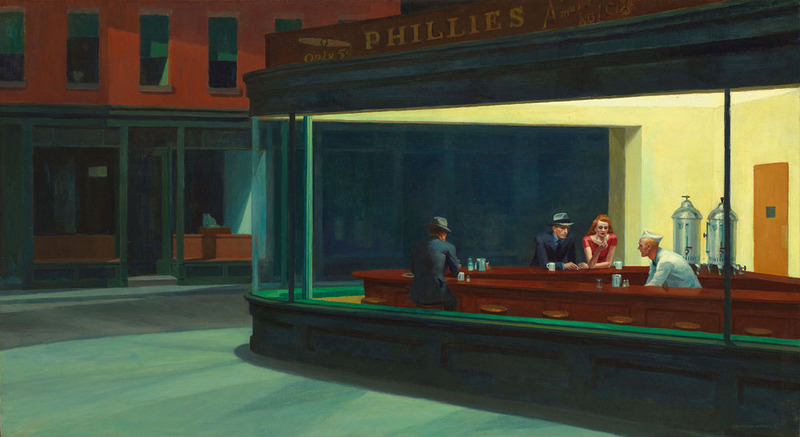 Rick and Ruth would be placed inside a large kitchen space encased in glass like the diner scene in Edward Hopper’s iconic painting Nighthawks. We would observe them sitting in their kitchen—drinking coffee, talking, cooking and eating breakfast, lunch or dinner, reading the newspaper, playing Scrabble, baking cookies, celebrating their birthdays and washing and drying dishes. The display would offer viewers an unfiltered window into the life of the couple, and the images, sounds and conversations would document Rick and Ruth’s ease of interaction. The goal would be to reveal the secrets of this happy marriage. As a result, the exhibit would aim to answer these central questions: What makes this couple different from others? What is the key to their bliss? And what advice or insights do they have for other couples in terms of making a relationship last? From a technical standpoint, Rick and Ruth would need to be well-lit and microphones would need to be placed on or near them to pick up clean sound; the museum would also have to mount speakers or headphones near the display so the viewer could listen as the couple communicates. As this idea spun wildly inside my brain, I felt a sense of joy bubbling within and I smiled when I imagined Rick and Ruth hanging out in their hermetically-sealed museum kitchen. Then, as the museum would get ready to close for the day, the lights to the kitchen display would be dimmed and Rick and Ruth would depart the exhibition space. And we wouldn’t be allowed to tag along with them when they walk outside the walls of the museum, get into their car and head home for the night. But I suspect not much would change between them, and I find this reassuring because I wouldn’t want to miss anything. Sarah McCoubrey’s mixed media works straddle the line between the real and the unreal, as the artist manipulates elements of nature to create a rich fantasy world that sparks viewers’ imaginations and is open to wide interpretation. 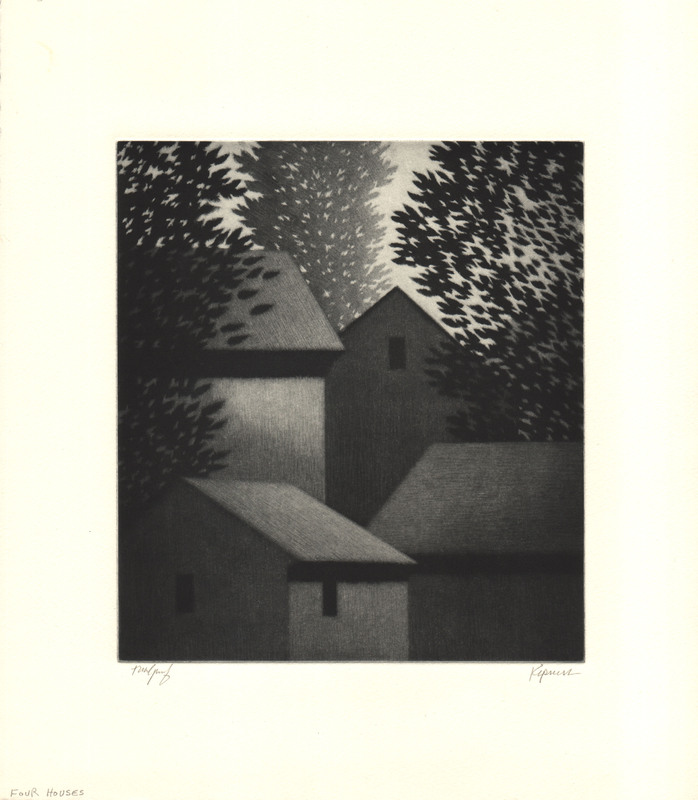 McCoubrey’s Works on Paper exhibition continues until Aug. 24 at the Everson Museum of Art in Syracuse, New York. McCoubrey, who is a landscape painter and a professor of art at Syracuse University, drew inspiration from hydrofracking sites across the Northeast and the industrial waste beds of Onondaga Lake in Syracuse, where she lives. The result is more than 20 works on paper, composed of digital images, mixed media and ink drawings, depicting a combination of twisted branches, roots and mounds of earth, slender, damaged trees, industrial debris and strange creatures emerging from the toxic ooze and crawling across stretches of barren land. I witness an older woman sitting on a bench in the exhibition space, looking up at a series of eight panels. “Is that a potato?” the woman asks her friend, who stands nearby. “Yeah, I think so,” the friend replies. The panels indeed show potatoes—one large potato per panel—in various states of departure. 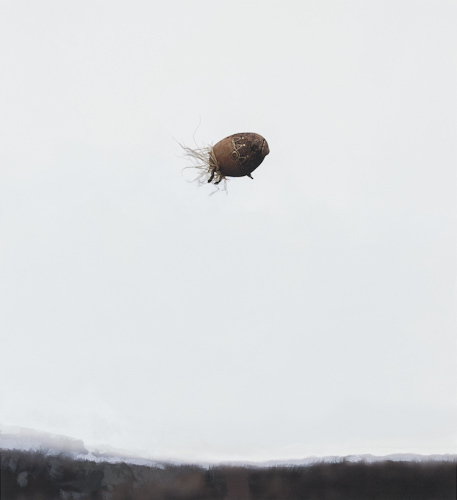 The tubers are taking off, fleeing the landscape either on foot or flying through the air. One potato—Escape Vehicle: Fat Potato, 2012—looks a little like a Goodyear Blimp, perhaps floating above a patchwork of farms and fields somewhere between Akron and Columbus; maybe it’s en route to an Ohio State Buckeye football game. 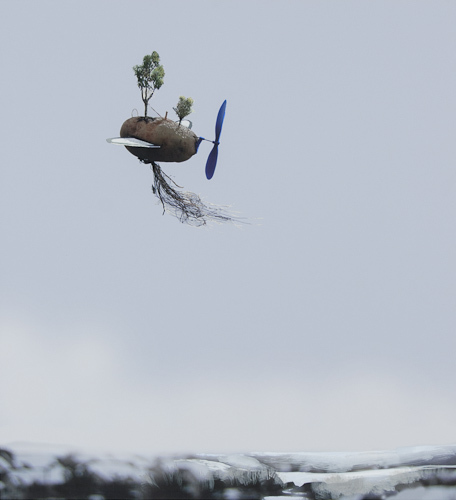 Escape Vehicle: Potato With Propeller, 2012, shows a potato with wings, a blue propeller and two small trees sticking out of it flying from right to left over what looks like the snow-covered hills of upstate New York. Another piece in the exhibit, Moving the Buffalo, 2012, recalls the beast from the 1954 movie Creature from the Black Lagoon, as a group of walking figures, constructed out of organic material like branches, transports an industrial-looking wagon across the ground. The foreground of the image is dominated by a curved patch of dark earth with clumps of roots beneath the surface and small trees dotted above. In the background, we can see boats floating on a small body of water, likely a pond. Map of the Wastebed, 2014, shows a map seen from above with fish and boats surrounding the site. Is this a scaled view of McCoubrey’s Eden? It reminds me of a treasure map and is similar—at least in terms of intent—to the map of the Hundred Acre Wood from the Winnie-the-Pooh series, written by A.A. Milne and illustrated by Ernest H. Shepard. The map gives us the setting where McCoubrey’s stories play out. And this is where the exhibition shines. There’s no doubt McCoubrey’s work is serious, as she calls attention to the damage of toxic waste and other threats to the environment. Her images portend a future world where the Earth seems to undergo a rebellion as the planet adjusts to cataclysmic changes. Yet she delivers her message softly by hooking viewers with her playful touch and characters that could be found either in a Dali painting or jumping off the pages of a Scholastic picture book. In fact I believe children would enjoy seeing this exhibition. They wouldn’t need to know anything about global warming, pollution and hydrofracking; instead, they could stand in front of McCoubrey’s prints and giggle at some of the shapes and figures while comparing impressions. It would be the art gallery equivalent of lying on your back on the warm grass and staring at cumulus clouds moving across the sky. And I am sure my five-year-old niece Elizabeth would get a kick out of seeing some potatoes zipping through the air. Sarah McCoubrey: Works on Paper is part of the museum’s 2014 Edge of Art Series. For more information, go to http://everson.org/. I spent a recent weekend at the Wingate by Wyndham hotel in my hometown of Rome, N.Y. Besides the amenities of a free daily breakfast, a 24-hour fitness center and a coffee pot in my room—which I consider a necessity—I enjoyed another perk I imagine most people overlook when roaming through lobby of a hotel or grabbing a soda at the vending machine. 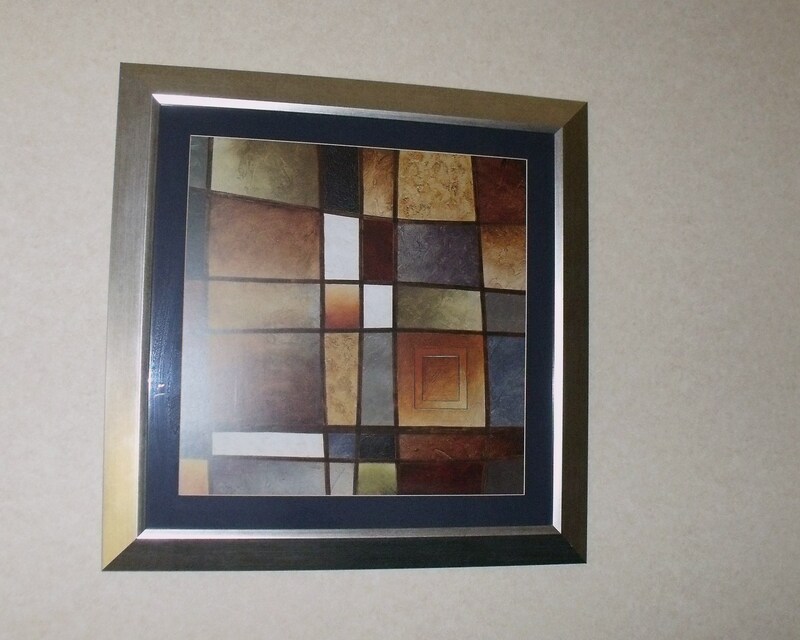 It was the collection of artwork hanging on the walls of the lobby, in the hallways and in my room. I think the abstract works were acrylic paintings or mixed media pieces, and it was obvious they were all made by the same artist, although I never determined his or her name. The prints were mounted with navy blue matting and had wide silver picture frames. I admired the simple, elegant designs and lush color schemes. Tan, orange, rust and turquoise colors dominated the surface, and what looked liked black graphite markings outlined circles, squares and other shapes filled in with acrylic paint. The textures, patterns and colors invited the viewer in, but did not overpower or call attention; the effect was a feeling of serenity. If I needed to rehearse a business presentation in my room I would welcome the chance to glance up at these paintings, taking a visual break from memorizing the notes, charts, graphs and sales figures. I think looking at the artwork would allow my mind to wander briefly, getting lost in the landscape of colors and patterns. Perhaps the reverie would relax me, making me feel less nervous about the presentation and even lowering my blood pressure. 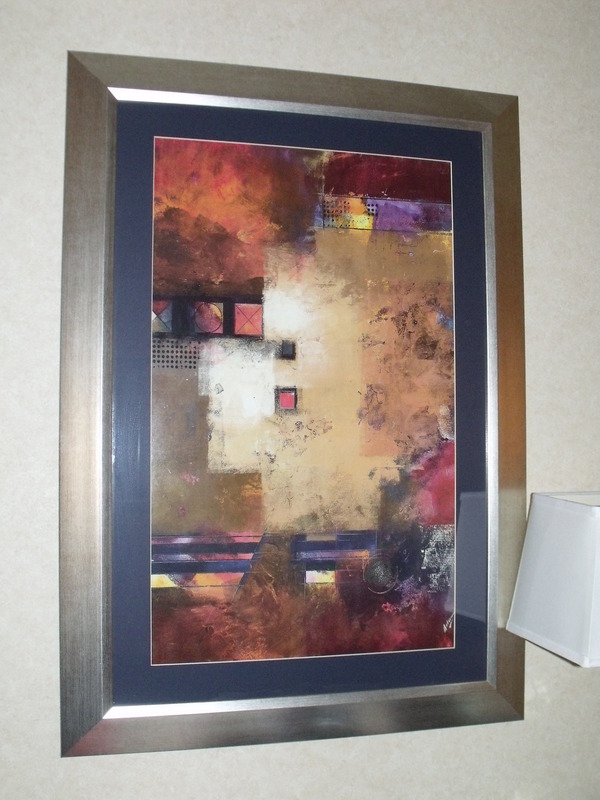 Obviously hotel art does not attract attention like a Warhol or Dali exhibit at the Museum of Modern Art. 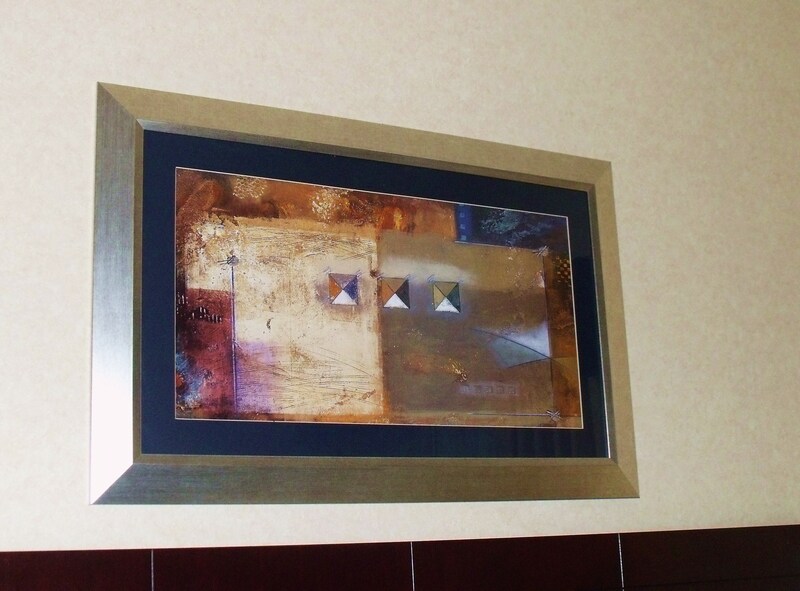 And in the rush of checking in, carrying your bags to the room, swiping your key card and flipping through the HD channels on the television, you could easily miss some of the art pieces scattered throughout any Marriott, Hyatt, Crowne Plaza or Sheraton hotel in America. And this recognition made me realize I have to sharpen my sense of awareness, being open to the possibility of making discoveries amid the bustle of keeping on schedule and crossing off items on the day’s itinerary.